Read more about Taquitoria and all of our NYC picks in New York City: The Gluten-Free Guide, available now on Amazon. After enjoying an evening out and indulging in a gluten-free beer or cider, a late night snack can really hit the spot. If you’ve had to pass on the bar nuts, say no to the cross-contaminated french fries, and politely decline the wheat-filled pub grub menu throughout the evening, this especially rings true. So what’s a gluten-free eater to do? If you’re in the Lower East Side, make a beeline for Taquitoria. This small storefront keeps it simple by serving only one thing: taquitos. These fried Tex-Mex wonders come in orders of three or five and are made fresh with corn tortillas; filled with beef, chicken, pork, or black beans; and topped with your choice of sauces. Guacamole fans will love classic style with guac sauce and cotija cheese, and cheese lovers will appreciate cheesy style with nacho cheese sauce and jalapeño relish. If you can’t pick between the two, don’t worry! Ask for your order chronic style, which includes all of the above toppings. If you need even more in your lineup, Pancho’s red sauce comes with every order. At Taquitoria gluten-free is easy. Since everything on the menu is gluten-free, you don’t have to call ahead to ask about gluten-free options. There’s no need to ask about cross-contamination, shared fryers, or food preparation surfaces. Your biggest problems at Taquitoria will be ordering enough taquitos (these delicious snacks go fast!) and deciding between classic and cheesy, both of which are pretty tasty decisions to make. General Manager Brad Holtzman offers a unique explanation for Taquitoria’s gluten-free focus. After working in New York’s restaurant industry for years, he and his business partner had encountered every food allergy, restriction, and preference possible. Ensuring that Taquitoria’s menu is gluten-free and incredibly simple means a more pleasant and easy-to-manage environment for everyone, diners and servers alike. Nestling Taquitoria among countless bars and hotspots in the Lower East Side just makes this find all the sweeter (or, more aptly, cheesier). Disclosure: Taquitoria kindly provided me with complimentary taquitos. All opinions and enthusiasm are my own. Where? 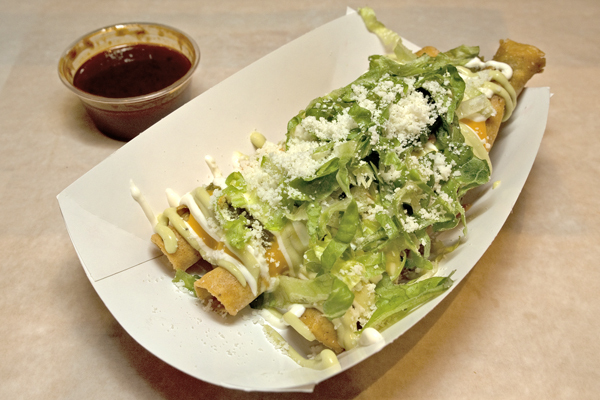 Taquitoria is in Manhattan’s Lower East Side: 168 Ludlow Street, New York, NY 10002 (212-780-0121). Yes! These taquitos are SO good, and Taquitoria couldn’t be more conveniently located. Yum, those taquitos look delicious. I bet even a treat for those who are not exclusively gluten free! Enjoy your travels!